The Library Suicides is released on DVD October 31st. And to celebrate we have a great competition for you and 3 copies on DVD to give away. 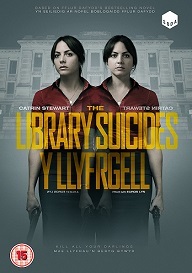 The Library Suicides (Y Llyfrgell), the debut feature from award-winning director Euros Lyn, and based on Fflur Dafydd’s bestselling novel Y Llyfrgell, is an offbeat thriller, set in the National Library of Wales, and explores the secrets and lies at the heart of storytelling, and asks who has the right to tell the story. When a famous author commits suicide, her librarian twin daughters are lost without her. Elena’s final words suggest that her biographer Eben murdered her. One night, the twins set off to avenge their mother’s death at the National Library of Wales, but are disrupted by night porter Dan who becomes unwillingly caught up in the saga. The cast also includes Ryland Teifi (35 Diwrnod, Tir) and Sharon Morgan (Resistance, Torchwood).